Report on library management horizon picked up on open source as one of the potential areas for development, a peripheral interest at the time but the report made clear that we should keep an eye on this. The report led to JISC commissioning some projects on library management systems – some on the user experience and interface, and two smaller themes on electronic resource management and the other on open source – there was only one project in each of those strands. Ironically those two projects are the ones that have snowballed and we are doing work with SCONUL looking at requirement for shared electronic resource management system and we’re also now starting to look more at Open Source work and projects, tools like Koha etc. So it seemed important to tap into the community that already exists and is interested in open source and the mashed library community seemed like a key group. SO that was not just about yesterday, the mashed library element, but about today – to look at what we might do. Library systems are not as mature as it liked to think it is – it’s a little bit like a teenager – it can be annoying but it can also give you a glimpse of the future and of potential. We will be tight on time this morning so speakers will be getting hurried along if needed. Ian used to work at JISC but has now moved onto SAKAI. Very few fixed positions in what we’re looking at. Some people take slightly religious perspectives on this stuff. I’m going to be less old profit and more storyteller today. Back in the midsts of time when computing 5Mb disk drive – the size of a trunk! Software used to come with the box – and designed by major organisations and their business models at that time. The industry was based around small sales of large hardware. But that all changed with personal computers and what was made possible by them. And they started to be used for serious business needs. By the late 1980s/90s we had a model of large and small corporations selling software, only a few major players and that trend has continued despite the ideas of peopke like Richard Stillman who have tried to drive free and/or open software. Spoke to senior staff of universities and found IT systems of $100m ERP or $40m finance systems – not core business of the institution but administrative. Performance not necc. great or well suite dto HE. Proprietary and difficult to customise. And because of the relatively small market the people he spoke to felt there was a tendency towards monopoly or duopoly. However we have since seen a real growth in worldwide colloboration over th einternet that has enabled open source communities emerge. Some are quite pyramidal (e.g. Linux or Moodle), some are more collective and collaborative. Of course this is all still very exploratory. The Cathedral: a closed group of developers create code then release it to the world openly. But development process is opaque. Brad Wheeler, CIO, Indiana U suggests a middle ground – a pub between the two with some things open, some closed. My own experience tends towards more open approachs. So the community source definition is about an organisational spectrum and evolving principles that takes strengths of open source and applies it to HEIs. Community Source Foundations are broadly membership organisations, elected boards – typically not for profis; coordinated contributions from community; foundation (few people – SAKAI is 6 ish) looks after: tech infrsrtcication, IPR, licencing, events etc. 2004 SAKAI started up (named after Japanese chef!) – global, learning and research collaboration, recently became multiple product organisation. SAKAI in use as replacement for VLEs, as research spaces etc. Membership investment $+iK and thus CIO involvement. 2006 Kuali appears. Largely north american. Multiple admin systems projects. Finance, library, research admin, students etc. Many are in development but a few deployments. Tighter coordination. Membership investment $+iK and thus CIO involvement. Product Functional, Technical Council. Licences – liberal regime so to give an example from Sakai the regime has encouraged commercial participation (22 Sakai commercial affiliates). That gives the community a range of adoption chocies and availability to move between them. Always the opportunity to set up yourself with community support. However there are also service offerengs from commercial operations to help with integration and deployment. Also a commercial distribution. And a move towards hosted offerings of Sakai. People talk about the choice between open source software and commercial software. But that’s the wrong comparison. The opposite of open is closed NOT commercial. A lot of commercial companies are making a lot of money from open source software. adoption alone is no guarantee of sustainability – adoption is th ebeginning of wisdom in some ways. By being involved you have an opportunity to have input into how that software develops. Choose the red pill – away from the Matrix and towards supporting your institutions independence. Next up is Ken Chad. He’s one half of the brain behind this 2 day event. Owen led Mashed Library yesterday, Ken’s is to lead today. You’re all familiar with open source. You already use it – Linux, Apache, maybe an android phone, etc. So I look at why people do this – for me it was a question of buying a netbook and not being prepared to pay £400-500 for a licence. I went the not quite open source route but it was free for me. Benefits are that it works fine (open office/linux?). and it’s cheap/free. So, what is Open Source? Licensing generally ensures that no one can exclusively exploit the software. But Lawrence Lessig (free culture penguin 2004) says that it depends on law just as much as Microsoft does – the rights over usage are governed by the same law. What is it? – quote from Raymond. The metaphor is useful but you also have lower cost and, crucially, better quality software. It’s just a better way to do it (see also JISC/Sconul LMS study 2008). Open Source – the quintessential implementation of peer production. We are social producers most often. Benkler sais it was too expensive to do this pre-internet etc. Now it is viable and competing all the time – in music, in telephony – this model is working in the marketplace. “positive deviance” – power of positive deviance – Jerry Sternin, Monique Sternin, Harvard Business books 2010 – example of Linux changing community from bottom up. This is all part of the wider “open” thing. There is a mix of trends around cloud computing, open source software, escience, digital humanities, open data etc. An aside on “free” – there is a lot of freeware but not all open source software is free. it’s not the definition of open source. And an aside on free(dom) – some peoples motivations are the Stallman philosophical nature of free speech, liberty etc. But open source also makes good business sence. So, for instance, a venture capitalist (Richard Gorman, Bay Partners 2007) – good bus models for entering large existing markets and taking significant share creating sig customer and investor value. It’s mainstream profitable business sense frankly.Open business models (Henry Cheseburg, Harvard Bus books etc). Vendors revenue generated from support services etc. Even those in the LMS market using proprietary software mainly make money from support anyway! Next opportunity for open source – content management/social software. We are behind the curve in the UK but we are seeing things build, maybe a tipping point is approaching. CNET – Matt Asay, 26th Dec 2009 – Open Source became big business in 2009 – talks about open source as a fundamental business strategy. In the business world there is a view that the community bit can be moved on from and you just plan how to make your money this way. Tipping point for some is Whitehouse using Drupal – a big statement on the role of open source. Is open source an answer to market failure? Rebecca J Griffiths and Paul Courant – Courant report 2006 – people were spending millions and getting unsatisfactory software. There was good reason to feel there was some market failure in administrative systems for HE. Not clear around library systems. Duke University Openlib project – posted that “we don’t think those companie are likely to meet libraries needs in the future by making incremental changes to their products” – LMS are like the MS office of the library world. They are not innovative, they change very slowly. Carl Grant, Care Affiliates blog 2th July 2007 – Carl used to work at proprietary software company, now does again, posted about the dissatifaction with current commerical software suppliers. translation – if you want translation to Welsh say this is doable which isn’t commerically feasible in other models. mitigation of vendor/product collapse – open source never goes out of print so you don’t lose GOOD code. Factors that make open source software attractive – slide from North Bridge Venuture Partners Future of Open Source Survey 2010 – rapid pace of innovation is important not just avoidance of costs or lock ins. survey of ope source integrated library ststems – thesis at San Jose State Uni. Linda M Rieqe August 2008 showed that there was a perception that proprietary systems are more expensive and that’s good. But the North Bridge Venture FUnd… survey say it is about rapid innovation though you require effort to contribute to open source. Beliefs about using open source – turbulent economny good for open source venodors. And open source around 25% of software costs/usage now – a serious part of what is being done. lack of formal commercial vendor support – actually in the UK it was the emergence of a support company that has started to drive open source uptake. The same happened in the US. That support availability is important. Accenture: 29% of orgs willing to share their own developments. Lack of senior manegment support. barrier of trianing developers require to use open source. Organisations need to decide whether they actively contribute back to the community – we need to look to that ourselves – how will we contribute back to the community? Challenge of social production: Benkler argues that social production is not a fad but a fact. How will this new model of social production develop alongside the traditional industrial information economy? Open source in the library domain: 2009 Marshall Breeding Library Journal 1st April 2009 said open source systems such as Koha and Evergreen are now routine operations (in the US). In 2010 report he modified that it will be a growth sector in the industry – it’s not taken over form propritary software but is routine. ALA Midwinter 2011 – top tech trends – library journal. 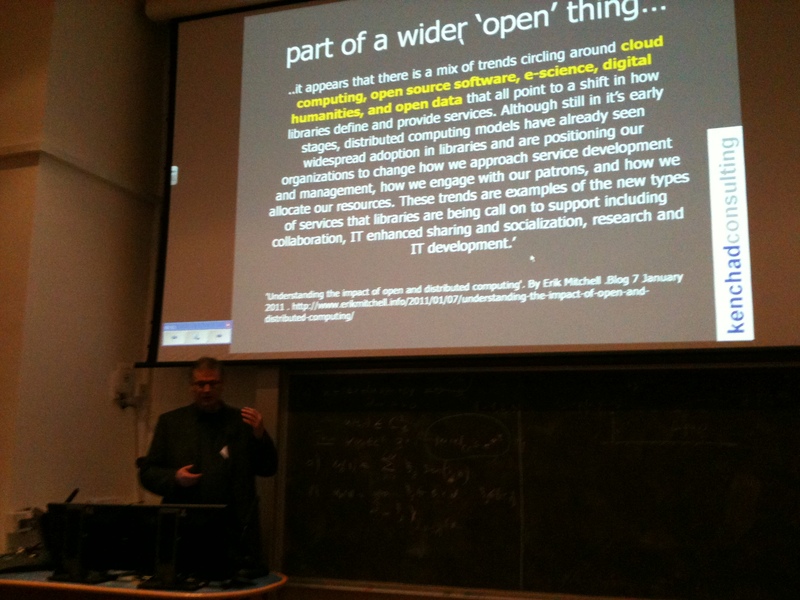 13th Jan 2011 -Mitchell noted that OPen source ILSs were interesting but not progressing at a fast pace. Electronic resource management is the key area of concern at the moment. Only use OSS as components (to reduce costs) – Primo and Talis are both open source for instance. Open source is about distributed innovation and will become the dominant way of producting sofwtare. This is a hugely important thing. How do you procure open source without such companies? See: http://helibtech.com/ – open source article there can be edited by all so do make any additions! Q1 – David Kay, working with Ben on this stuff) looking at ERM stuff lately we looked at CUFTS stuff. Whole suite of stuff here with ERM adn search adn discovery etc. But can these open source providers supply the data that site behind these systems – the OpenURL resolvers, the Serials Solutions information. Simon Fraser begging people to populate their knowledge base. A1) Crowdsourcing does need to be done a different way to make this work. How do we do that? Q2) If coperation needed to be succesful was going to work, wouldn’t it work in other sectors? nothing like it for support for hardware. Even in a small place like London what is the level of cooperation there in centralised provision of hardware support. Why do all universities replicate same thing at such silly costs. If one asks oneself how to make this successful we need to look at the past and look at whey cooperation hasn’t worked. A2) I don’t have an answer but it’s a good wuestion. That report said there are a lot of consortia in the US – why not in the UK. Q2 again) doens’t legislation require those consortia? Comment – Dave Flanders) Open Source goes back to the 60s going all the way back to the processors etc. But beyond that. The one point I’m interested in is the next great challenge being to get the community to give up and share the community. Are you seeing discussion between developers. Are we seeing a bubbling community? A – David Parkes, Staffordshire University) From our IT departments POV there’s been a lot of interest since our announcement at Christmas. Lots of interest not just from post 92 university perspective we have. 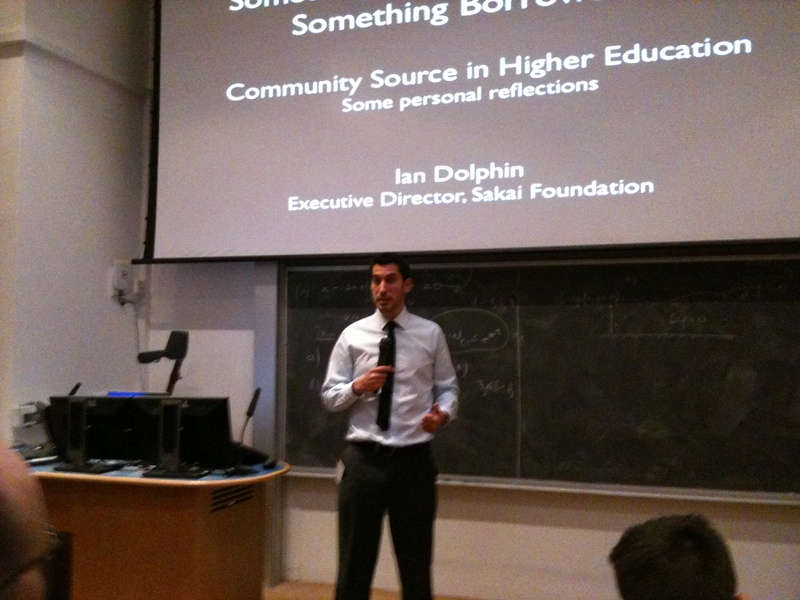 A – Ian Dolphin) not a lot of UK unis have software developers on staff – US ones do – but people find other ways to contribute like paying companies supporting them to contribute back to community. The OU has adopted and given back to Moodle. Good contributions of code in Sakai from Oxford, Cambrige and Hull. There is development played back in but is it enough? Hard to know. Healthy signs but slender shoots at present. Q3 – Nik from PNTS Europe) people commission us to do software on their behalf and it is a given that we contribute that code back into the community. For instance surrey supporting rollling loans, etc. Ken again: today we need to find what we need for JISC and SCONUL To take on and forwards to create something that will encourage and support open source. My error was to misjudge the coffee break. I’m not sure I’ve given enough time for coffee! Ben is introducing a session on ‘Open Source in the wild”! Staffordshire University are the first university in the UK to adopt an open source library management system. We made the decision about a year ago and it seemed really difficult and a huge decision. In some ways the business case is easier now – we just need to show the difference in cost (to financial director at least). So, this will be the summary of what we have learned. We did a lot of preparation and a lot of research but we had to do something or we would have stagnated. We asked a lot of questions and spoke to all types of user and university member. We asked IT colleagues and that was very useful as they saw this as a critical system. We asked students – for instance 27% of our students were using mobiles and accessing library systems on them. We did huge amounts of desk research, took part in forums, asked colleagues overseas, lots of tweets and posts and mailing lists to get the full landscape of what was going on. The costing was pretty good – did that early on. We wrote to everyone who is in this business both open source and proprietary so did lots of scenarios comparing those costs and options. Something emerged from narrowing down those results. We sanity checked with colleagues, we spoke to librarians across the UK. So we went and spoke to everyone to say what was possible and what was wanted. We asked what was important. We did a sort of Dragons Den with students for ideas – we have to do the same thing to executive board at the end of this project so very useful! We has to ask difficult questions – could we meet expectations. We created scenarios for all the options. What are propriertary vs open source vs hosted possibilities? How will our system fit with student system with CRM etc? It was quite exhausting as a process! A big thing for us was to befriend our IT colleagues. The IT staff couldn’t see it – what do you mean you don’t want our server room? What do you mean we can’t wait till September to make that change? so we talked to them, we showed them examples, we shared facts on the software, we downloaded the software and demoed it. None of them liked Koha, preferred other systems as it happened. We showed IT colleagues where they will be needed and how the software works. What the positive benefits could be to other systems. Things that would benefit staff but also was seen as a threat to them. Hard to get over the procurement process difference here. Really key to have IT on board. We are a peer reviewed institution – we said this is peer reviewed software. Also we are part of a group nationally to reduce our carbon footprint by 10% next year. Our Green IT initiative is helped by this – even if we’re just handing it off to Nik! We also gave IT loads of documentation, online guides and resources. the procurement was very difficult – the business apps people had trouble getting over that. So many questions around that. So many attempts to compare systems from Sysco or Microsoft. It’s a different model and it’s the one thing we underestimated – it’s so different. Christopher Hitchens wrote an essay (letters to a young contrarian) about what would be done different. If I was doing that it would be about more on winning the hearts and minds of IT. All this legwork and doorstepping people and committees etc. We showed FInance the costs and projected costs for 3 years and how it would take three quarters of the cost of normal procurement out. I told learning and teaching adn research committees how the system would be different. What it would mean for populating other parts of the learning experience – what it means for research systems, the management systems for information elsewhere – lots of interoperability and interfaces between systems possible. Also lots of talk to library finance, acquisitions and purchasing. They understood their part of the system but this was s seismic shift in understanding. So we built our movement. The NHS has an institutc for creative thinking and that’s a brilliant resource – they have stuff on social movements and how it transforms care throughout the business. We thought about using this technique. about building community and getting students and faculty involved in this. We had students and faculty on our steering group. We also talked to every supplier and services provider for saas. We spend a huge amount of our resources on services that very few people use so we knew it was important to get those resources into this new system. As part of that general movement. What your existing suppliers who you spend so much with to fit your needs. We looked at a risk analysis of these too. We also spoke to users overseas as well. We made a formal business case. We did that and distributed it widely and also did the super brief executive versio. Risk was a major issue – what happens if someone in the change folds, what will you do. We talked about managing risks and how we had talked to community and suppliers. We showed project costs and savings – an instant way to win hearts and minds (and that was before the comprehensive spending review and before the last budget!). The timing is good as we’re starting to see the dividends already in reduced costs. We offered all candidates in the business case but provided an obvious preferred candidate. This was the range from staying put right up to a full new proprietary system. We went through a tender process. There was not a great deal of response to the tender process. A French company I cannot name said they’d love to tendor but “it’s August”! .But we continued to be inclusive throughout this process. We blogged and had an internal wiki to track progress and access the project plan. The tendor process is where IT colleagues panicked again. They were very concerned in the interview process and it was extra rigerous because of the very different process. Implementation… We’ve really lifted the lid now and a real movement in the university towards open access. As well as our ssystem we are also an OER institution with a mandate for theuniversity. There is a real shift in the institution. We have continueed to build partnership and we tell people and tell them again that what you are doing, they are part of it, they signed up and are intregrap to its success. Oh… and don’t do it first! But you don’t have to worry about that now that we’ve done it…! SWWHEP (South West Wales Higher Education Partnership): Episode 2. I didn’t know there would be a star wars theme yesterday so this is pure coincidence! SWWHEP is a consortia of 3 Welsh univerities. The project was a Virtual Academic Library project with funding of around £1million. With the goal fo reciprocal borrowing for all staff and students, physical and electronic document delivery, implementation of RFID in th elibraries, shared storage for low use materials, exploration of opportunites for single management of services, coordinated approach to staff development and shared implementation and discovery. 3 LMS’s (Ex Libris Voyager, SirsiDynix Horixon, Talis Alto/Prism) needed to be in a single discovery platform. Customisable – a theme today and an important issue for us. Cost – an interesting one. I came in as project manager with a full project in place. I was to implement it but there wasn’t a budget line attached at the time. But what we were looking at was a huge move forward but with very littl emoney and little scope to spend lots. We looked at the market and at both propritary and open source options. Functionality, cost and flexibility needs ruled out mos of the propritary options. The exception was federated search – we weren’t quite convinced that there was an open source option. That was about support and knowledge base rather than functionality of software. Also integration capabilities was important – with the three LMSs and other systems – none of the propritary systems looked likely, better to take control of our destiny. stable – can try before you buy with open source which is a huge advantage and we were very impressed with the stability of VuFind. possibility of integration with SFX/Metalib – the chosen tech for federated search and OpenURL. Out of the box the product didn’t do everything we wanted. A big importance for us was multi-site implementation. Additional Functions – place hold, cancel hold, renew items – plus lots of other tweaks and improvements needs. We’ve gone for a single set of branding for user services – if the tech changes the exposure for the student will be minimal as branidng can stay consistent. Branded as iFind (with crescent moon or left bracket at start). When you search you can see faceted search, suggested topics, etc. We’ve added in funcationality for cite this, email this, add to favourites and tagging. Various internal conversations on tagging and whether we let others use this. My view was why not trial it. It may be heavily used but we should put it out there and deal with abuse if it happens. So far little tagging and no abuse. You do have to login to tag – that’s the concession for safety/concerns. What we did find for multi institution information it’s difficult to create a tidy record so we’ve gone for a tabbed approach and you just click on the institution. Development: Open Source Mediclorians – a Shambrarian Scale – various skills here. We have seen our developers move along the scale here. There have been discussions about skills needed here. What I must say is that skills development picked up with open source for developing and supporting VuFind can be reused in other areas. We are working on Relay and SFX/MetaLib – these skills are an investment in future services rather than money towards a particular project. Merging Marc Records – have heard it said that MARC is a dark art. Solution: get dark side Sith Master to merge MARC records for you – we had one to hand whose expertise we could use – updated nightly to merge records anew. See slides for fields used to do this. community has been very very good – putting a request on a mailing list gets a response in an hour sometimes – can’t buy that support. BUT the community went through a tight spot where the community lost a key player and there were problems but the community has since recovered, pulled together and really may be stronger now. capital cost – nothing on VuFind, some virtual server linux support costs but that’s about it. Not the six figure sums being quoted on prietary market. Partnership – the good side is that you get a lot of feedback you wouldn’t get internally. Saves time and effort when within a good governance structure. Politics – sort of ties to partnership. Not always been a happy relationship between the institutions. library services work well together but you are at the whim of those higher up. YOu can be doing great work and be instructed not to talk to or step onto campus of other institiutions. Leads to interesting discussions in coffee shops and service stations etc. YOu have to separrate your aims and goals from wider political HE picture. Staff resource – we were lucky to have good internal staff resource. we couldn’t have brought third party support at the time. If someone was developing VuFind outside their day job that would have been a huge ask. Staff time – this has been full time work for our developer for nearly a year. But what is staff overhead for maintenance and to keep things going. Changing mindset – in HE we are used to handing money to third party to do work and a systems librarian to mediate and call supplier. Without a support contract all of a sudden you have ownership so if it breaks you must fix it and resource discovery is a business critical system. That’s a real challenge. Patrnership – good governance is crucial – decisions can be slow even over something like the name on th einterface. Index Data is an open source company that has been running for 20 years – long before others came in – so it’s hugely gratifying to know that open source is mainstream now. I am a programmer so my perspective will be rather different to others today. In particular looking at searching and indexes. So, Search starts with the user. You look at data, see a result and get a happy problem solved type of answer. Maybe I’ve missed some steps but with products like Solr you sort of can. Until a few years back everyone was happy with searching. But then it was annoying that you had to search in lots of different places for the same things. Until a few years back we worked on lots of metasearching – a magic box that transforms the query to multiple places, merges results and brings them back for the user. There are a bunch of products that do this stuff – 360 Search, EHIS (EBSCO), MetaLib and our own engine Pazpar2 (Open Source). Few open source matasearches and Pazpar2 is really just the magic box (positives and negatives to this). Metasearch/magic box may also be known as federated search, distributed search, broadcast search – take it as read that I mean all of these. Fat database also known as local index, discovery severices, vertical search. No standard names here! We need a controlled vocabulary! Today it’s Central vs. Meta Search. Which approach is better? Well both are really useful. allows data to be normalised – can be standardised such that you cna extract and index date say. may have access to some data that aare not searchable. Cue Dilbert… should we avoid a lawsuit of build something no-one will use? Boss says “both!”. But here central vs metasearch really is a case where both is better. We have lots of terms for both types of searches we have but no name for the combination. For now lets try “integrated search”. 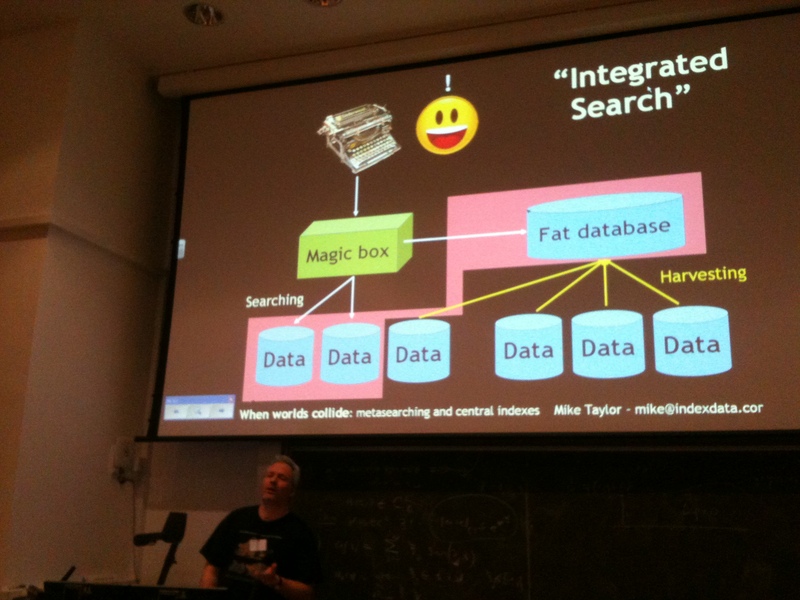 Here the searcher looks at a magic box – looks out to datasets but it also searches the fat database. Exactly the same approach in both searches but engineering wise it’s a simple connection with perhaps a different protocol to do this. The magic box only knows about the source databases and the fat database but we can shuffle how this works as we want.So that’s where we want to be – in a shuffleable place for any data source. But lets go back a bit… Metasearch hides complexity. The user does not see the tricky stuff. Perhaps an analogy is an iceberg, perhaps a better one is a swan (it looks elegant but there’s a lot going on under the water). With that in mind here are the problems of doing metadata searching well and how those problems change when you try to integrate searches here. But Masterkey is only one way to use pazpar2 – can use in lots of way and it integrates with other vendors’ UIs that people already have. #1: no data server at all! Option 2: MasterKey Connect (non-open) (indexdata.com/connector-framework) – deeply magical to use and you teach the service to build a connector via the browser and the way you search. However shared with OCLC so not open to share code. e.g. in Z39.50 you want to do an author search you use an access point – so author is either access point 1 or 1003! Masterkey knows what to do from IRSpy and passes info to pazpar2. pazpar2 does its own relevance ranking (part of the merging/deduplication process) – TFIDFL driven relevance ranking. But never quite as good as a proper index search. pazpar2 calculates its own facets – based on occurance of authors etc. and figures out facets on it’s own. Not perfect but very effective. So in those meta searches there is a lot of magic in the magic box! Do play with pazpar2 – its free but it’s nice if you let Index Data know what you’re up to. So that was an overview of those searches… what about those integrated searches? Data is often only in a user-facing Web UI – you can’t harvest Google! You must use metasearching for these which is one reason Central search alone isn’t everything. Extensive data-cleaning is usually required – even with a tolerant client. So you sort the ranked and unranked materials along with Solr (ranked and with scores). If you set up metasearcher for multiple Solr targets that can be taken advantage of as well. Lots of ranked and unranked lists with scores. So can organise all scores into a range. lists of field values with occurrence counts (for example authors of programming books!). But how do you deal with that when metasearch databases do not return this. Here we have two servers showing results – you know the number of hits – so you normalise proportionate to harvested number of records allowing you to rank/compare and find approximate number of hits – as though you have all records in result sets. Fringe benefit: fecet count normalisation also useful for pure metasearching. And finally a reminder… be a swan. It’s unrewarding for a programmer. Users think it all just works! If you want to fine Mike to ask anything or chat further he is the only person here today in a T-shirt printed with dinosaur bones! 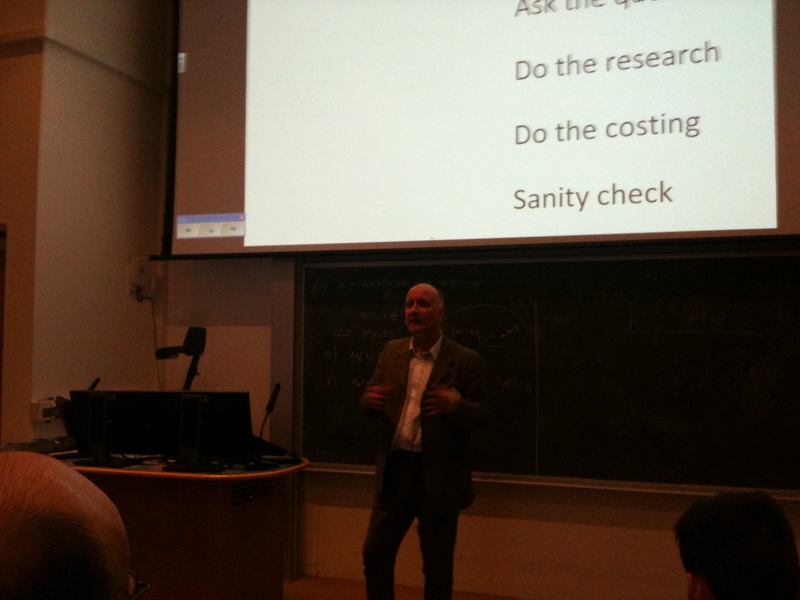 Q1 – Andrew Jackson, NHS Scotland) for David: on tendering process we went through something similar. After a year or twos work on this background, operational requirements, site visits, etc. What is normally missing in that process is library staff ability to sit and use and trial system in pseudo live setting. Did you have a chance to do that for a change and get feedback from staff on what the operational requirements were. Q again) not an unfair comparison then though? Q2 – Matthew Phillips, Durham) you tendered for LMS but was it for a system or for support for an open source system? Q3 – Bette ? 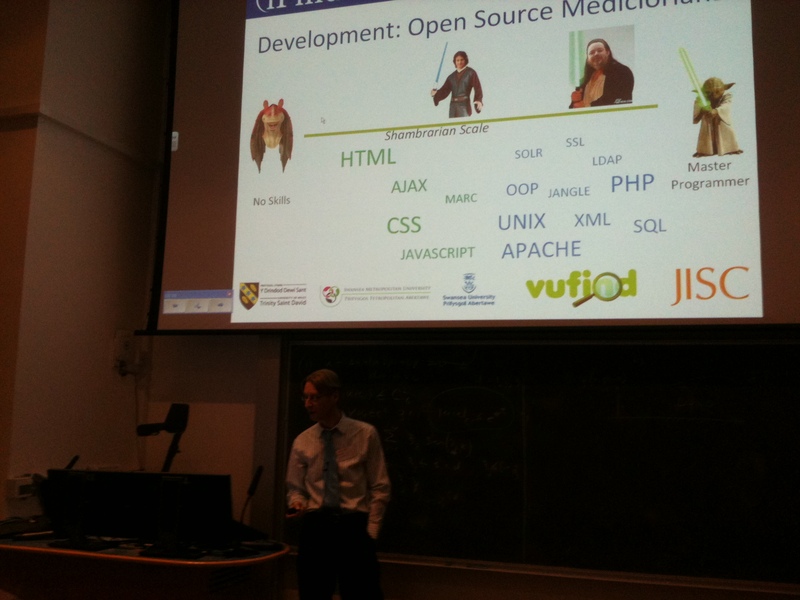 from Nottingham Trent University) what were concerns re: Open Source vs. proprietary system articulated? Q3 again) have they been won over now? A4) I think so, especially as we had a tight timeframe for this being implemented. Q4 again) went out in November 2009. We had no open source response though we had a demo. A4) Just a year later that would change. We only had 3 responses in total and only 2 full quotes. In the end it was an easy choice to make. Q again) but why isn’t this normal? Whether brought as proprietary or open source system surely professional understanding should come first – why not normal and only sane approach to assume that they are experts in work that they do. Q) if you were a company selling IT the pressure is to compete on marketing – to sell what they have. The people who will use systems who have to be very clear about their needs. Not just about specifications but also looking at whether you need one system or components etc. to truly look at what is needed and what will work best for our professional remit. Q6, Dave Flanders, JISC) what made you willing to put your necks on the line – it’s your job at stake perhaps! A6 – MArk Hughes) a professional motivation not to stagnate. To shake things up, move forward and try something new. Traditional models are, if not broken, then cracking round the edges and this is the way forward. A6 – David Parkes) and we really managed the risk here so it was the safest solution in many ways. And there we close for lunch! Open Source Software (OSS) is used and supported by companies around the world. PTFS Europe are one of those companies supporting OSS usage. Staff have a wide range of experience in library automation – initially SirsiDynex experienced but others have now broadened that expertise to many others. They support two main products: Koha and Evergreen. KOha is appropriate for many libraries. Evergreen is unsurpassed for large consortia. Customers of PTFS Europe 2008-11 – they are all for Koha excluding a few archive customers. Clients include National Botanic Gardens Wales, Staffordshire University (first UK University), Tavistock and Portman NHS Trust, Halton Borough Council (go live next week – first UK council). But also customers in Belgium, Finaland, France, Ireland, Germany, Italy, Russia, Sweden. Stirling Council (16 libraries) and East Dunbartonshire (8 libraries) will be first Evergreen implementation supported by PTFS Europe. That consortium is expected to grow. Announced today and result of full commercial tender. Open source library systems gaining acceptance? Limited to those sharing information on the lib lists but really interesting figures. New installations of systems – large install of Evergreen, and of Koha. Evergreen is mostly supported by Equinox in the US. Koha has varied support community. Of trad library systems Symphony is largest new install chunk on the pie chart. But tracking reporting is tricky – depends on the year that things are installed. Of those installing Koha a significant percentage install and run it themselves. Some conclusions: Open Source LMS are mainstream. Most use a support company. UK has been trailling but it’s changing. So what is a mixed economy? where mixed economies are compromise between classic socialism adn pure laissez faire capitalism and where the compromise is functionally superior to either approach. Supplier – we are the contractual anchor and we commit to functionality, cost, timescale – we’re the people who commit for this business critcal system. In practice we do hosting (SaaS), installations, data conversion adn loading into LMS, training, software development, support, bug fixes and upgrades etc. All those things you get from your current suppliers. A bit different as we are mediating open source community for you. A word from Colin – very committed to open source community. If we develop something we put it back in the community to ensure it is bug fixed and maintained etc. Latest release of KOha came out last week. 22 main developers put most of the changes in (120 others contributed). The number of people contributing increases every release. Growth in the community at the moment. Important to keep up with developments, that we can appply bug fixes, and that we fix client issues and share with others. Regular upgrade is important. IN the open source world – historically in the propritary world they sell you a software and they all do it differently and you can’t look at this special thing you want to do – we want to make it easier to see how to fix things, we want a toolkit for librarians, we want a common ground for librarians that means something super magical has to be in the software you buy to compete. You buy service not software from us and that is very different. As people move into open source… most of your propriatary systems are built on open source tool kits. Developers find that useful and we want the same thing for librarians. Lately there has been a proliferation fo OSS projects using Git for managing that project – it’s used by high profile software projects (ef Linux, Android, Fedora, Perl), distributed version control, handles huge volumes of data, allows merging of code etc. A very good way for contributors to communicate with each other. What we do as a company is we handle customisation as a branch in a Git repository – makes upgrades very easy. In proprietary environment we used guesswork and educated guesswork, Git takes that guesswork out and lets you track problems and bugs and you can test new releases etc. So for Staffs we have a Staffs installed branch that has custom stuff added in there but if it’s used elsewhere as well we may have that in our central database. We can merge upgrade in very easily and watch problems as they are flagged up. Allows Koha to get into situation of scheduled releases – like Perl – your system is guaranteed to get better! Back to Nik, So that’s our role but the user has a key role in getting requirements and buy in, of managing change, and to involve potential suppliers at an early stage, and that risk analysis – thinking carefully about moving to open source vs. staying where you are. So you should get involved in the community (Listsercs, wikis, IRC, user groups, information on websites). You look for what you need and prioritise any unment requirements. No blind copying of existing systems though. Costing can be less but be open minded about funding developments if neccassary, possible and relevant. Collaborate with other users. And if you have got the skills you can contribute to the code as well. You don’t need to get involved in development of core modules. You don’t need to recruit staff (you may even need less). YOu can combine your staff skills with reassurance of support company. Benefits of OSS, high quality of implementation adn support services. Not free but cheap, increased autonomy, opportunities to collaborate, fast development, Low risk. I’m involved in DSpace, Sakai, Fluid, CollectionSpace. All started with a grant and, with the exception of CollectionSpace, all have moved beyond that original project etc. However there are so many more OS systems out there. Increasingly we can look at systems across the institutions and find ways to improve what we’re doing. Often for the user the mixture of systems does not work so there are opportunities for these systems to make more sense. Kuali Finance, Student, Research Admin, Open Library Environment, etc.Zotero, Evergreen, Koha, Moodle, uPortal, Mahara, Fedora, Islandorsa, OpenCast, Open Journal System, Vivo, etc. There are loads out there and we are beyond the point of things being scary. But it doesn’t mean it’s the right solution for you neccassarily. But what is it like to be part of the OSS community? Participate – contributions from user feedback, to QA, to coding. Code isn’t everything – a good quality bug report is a great contribution to any software project. Translating is also fantastic. Decisions can be easier because everything is in the open – try before you buy. Avoid data lock-in anxiety. Maybe this lock in anxiety is greater than needed. Our catalogue records for instance maybe we can or cannot reuse them. I’d rather not have to care than have to ask lawyers. Open source you don’t have to care. Evaluate the health of the community as you would do due diligence on a vendor – resources, motiations, track record – now arguably we do not do this enough with commercial vendors but being open source you can find things publicly and this process is easy to do. Perhaps we should share where you can do this easily. There are wikis, mailing lists etc. Can often be lots of information out there but not always easily accessible. Perhaps we can help guide those who are nervous better. If you want support, consider a commercial support organisation – unbundling of licence cost from support cost means you can evaluate value for money more easily and works well for many – certainly in the Sakai community this is common. Most commonly shared risks and resources mean significantly lower costs – but it is also wonderful to create a unique thing that you need but no-one else would and it wouldn’t be commercially viable otherwise. In the museums sector there was a comment that every institution felt it was a unique requirement but actually 95% of needs were shared, 5% was custom and this is where OS can really be useful for focusing only on the particular specfic needs. In the Higher Education projects so far the model is effetively a consortuym but open source licensing significantly reduces “friction” – no prolonged negotiation over legal agreements, partners cna come and go more easily. Now this may be a function of the fact that in many cases this is a grant funded activity. Consortium agreements on IPR, on activity if one partner leaves or joins etc. Complexity much easier when you agree to collaborate through an open source licence. Coming together to solve a shared problem is not new to HE but we now have the means to collaborate globally – that’s a bit newer (or at least much easier). Ability to see how successful products are built will speed industrialisation of software development – efficiently. participating in development can increase skills and help produce better quality software – and can be very rewarding for staff, lets them benchmark themselves against peers etc. open development allos others to build quickly on good ideas. 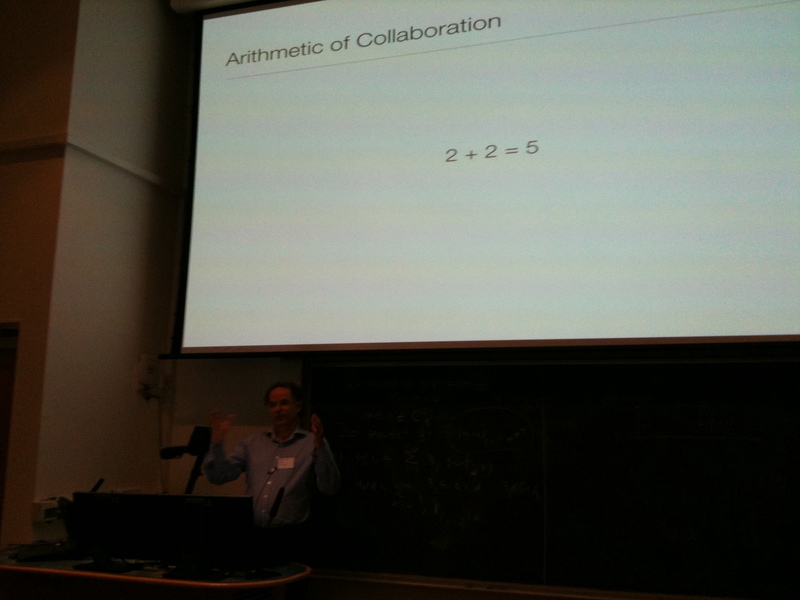 Arithmatic of Collaboration: 2+2=5? No the real arithmatic is 2+2+2=3 – it looks terrible but for any one organisation you put 2 in and get 3 out. It’s a good deal but you cannot underestimate costs and difficulties. Q1) What are we looking for for the good maths? Motivation – image of collaborative roof building vs tug of war – if you’re working hard it’s best to work together not against each other. And individual rewards from contribution – where you are in a consortium many are paid for work on a project. It introduces an interesting dynamic but there should always be a reward other than “its just my job”. It has to feel rewarding to take part. It can’t be created but community can be fostered and usually it can be joined. You can’t turn people into a community just like that. But you can encourage and build community. Licence cost around £120k will buy you say 2 developers – software rental licence. So sustainable with at least 6 institutions with developer resource have already deployed the software – adds up to minimum pool of developer resource – then it’s safe for me to get in – there is enough on board already and they won’t leave swiftly. So I’m safe to get in. Balance in the community is also very important. I want to identify a project, not sure if I should. I think DSpace suffered from this… it was extremely successful in terms of libraries using the software but many fewer contributing than using it and that means development has slowed and you can’t get everything done. BUT if there are so many developers users don’t feel at home in that crowd of all developers – and many won’t return to that community – this is an issue for Sakai. Comment here – the funded organisational model maybe encourages that? Maybe community driven would sort this? No, it’s as much because the end user community doens’t identify their needs as common to others – lots of dicipline specific stuff and user communities whereas Sakai is a generic tool. Interesting to compare to Moodle and they put a lot of work into Moodle Moot model to encourage individual hacking chat. But then much of that stuff stays at local level but doesn’t feed back into Moodle core – a strong filter causes this. Also there is a matter of finding a place for design. With all due respect to OSS I haven’t seen world class user interaction design in our open source systems. We can work with developers but few examples of excellent user interaction design. An area of current challenge throughout the OSS community. Q2 – Ken Chad) Are you saying that open source attracts developers but not the Steve Jobs of the world or something? WHo would they be? A2) Like a MAzlov’s hierachy of needs thing. We have dealt with getting developers, decision makers on board, etc. we’ve gone past that and now need to look at design. Ken again) well yesterday we had talk of interfaces for mobiles and designing for 900 pixels – this is the wrong question. It’s not about making it work but making it useful and usable. Colin) need interface to be looked at not by developers who have designed it but by those who do not know what it is to be done. If the structure of the project/grant phase is managed to exclude others, it’s bad – even if designed for the community! But if the focus of grant funding is the enabling of sharing community it can be good. And a comment: there must be a product or fucs to collaborate on, not just a community for it’s own sake. Release early, release often. We don’t like being out of control in our lives in general. Open source is an opportunity to take control, fix bugs etc. BUT you have to share control with others in the community and let go. If you are not ready to deal with this and need to stick to purchase and use behaviour you need a vendor – preferably for OSS of course. How many doundations? Well there are probably enough, consolidtion is already beginning. It’s tempting to try starting new things or temporary homes for IPR etc but better to share and focus on shared goals not difference. If you are going to get into open source you have to get into that and be happy with that situation. Q3 – Mike at Index Data) how did Sakai come up with governance model? A) it had been going for a few years and at the annual conference at the end of the grant we had a discussion from 9am to 6pm with people from 80 institutions all expressing deep personal views about what governance should look like. Interestingly Joseph Heidan who was chairing the discussion and wrote a governance document. A key issue was do you let commercial suppliers onto the board. We decided we would but it was a controversial issue. Once document written it was shared. some minor comments came back that improved it and it was done. What was needed was that place to share all feelings and idea and then everyone was able to understand and accept any compromises. Q4 – Dave Flanders) Can you talk on futures perspective and relationships and vendors and your experiences around that? A4) You might want to ask Ian Dolphin as well. From my persepective it’s mostly been all good. There have been moments with flare ups and questioning of vendor motives. There are some vendors that provide Sakai that is different from core code. Do you let people build on codebase for enlightened self interest. It seems to be working very well. We get adoption in so many places that wouldn’t have been able to interact with the Sakai community and that is so good for the product. It’s a good experience and I’m glad we did it the way we did. There are tough moments but in general I don’t feel anyone is getting ripped off. The vendors do contribute and it doens’t matter what percentage we’d like them to do. Q5) investigating vibrancy of project – frequency of release, bug tracker and resolution speed, how is the project travelling type metrics etc – these are all more useful than discussions round a project when it comes to judging. A) Yes, you’re right. But also you need general tenor of conversation – are people that’s polite or are they rude to each other. POsitive supportive communication makes a big difference I think. In terms of speed of project we have pressure for greater publishing of roadmaps for Sakai. But you can’t always predict behaviour of group and what will get done when. It’s really quite hard. Indicating priorities for next few releases can help though. Now to break for coffee (and a little light blog tidying for me!). Policy is often thought of as documentation. The act of creating it is important even if it goes up on a shelf and isn’t looked at again. We survey the FE and HE sector regularly and we ask wjat is your procurement policy on closed source software. 34.7% of FE and 15.2% of HE immediately say that they prefer closed source software. By comparison 4.1% of HE prefer open source software (negligable FE %). Having said that both are bad. You should select based onwhat is useful to you and functionality. 69.6%HE, 32.7%FE say Closed source is to be considered as an option. Higher for open source. Now 61.2% of FE and 73.9% of HE think open source is to be considered as an option. So for your policy what is that? If you are only considering closed source you have to change that and work out what must be done to let you consider both Open and Closed source. Change is happening quicjly. In 2010 there is a huge chunk of new software that is open source vs 2008 – a big success for OSS Watch and Open source movement in general. So what are reasons for rejecting OSS? 2. interoperability and migration costs – interesting that this is number two reason. And it exists in closed source software too and to a higvher degree. Perhaps this is people rejecting all options and preferring status quo but hard to tell. 4. poor quality software – falling every year as OSS best. 5. Not what the users need – falling every year. Total cost of ownership doesn’t appear AT ALL in rejection list. Engagement policy – you can be anywhere on that spectrum of participation but you need to know where you want to be so that you can articulate that to vendors. Only 15% of respondants in 2008 had a policy that staff can contribute to OSS. Dropped to under 10% in 2010. But you SHOULD have a policy indicating this. Or a policy that outlines provess for a decision. However a larger number of organisations (just under 40% in 2010) say that it is not regulated but working in practice – if it’s valuable it needs to be a policy. A similar number of participants say that staff can contribute on their own time under own responsibility (37% ish). This is a terrible positoin to be in. There may be IPR issues, there may be hacks in there that are not contributed back so when an upgrade comes you are in trouble. Evaluation techniques – OSS have lots of resources on this to help you do this so do call upon them. Ross) ANd the OLE project did something similar?
?) Core specifications – feature lists are easier for suppliers but don’t let them lead, core specifications far more important for technical needs. Mark) There is plenty of willingness in libraries to work together. a Bit of a sacred cow around location – you can work equally welll around communities of interest not neccassarily co-location. Also a political context in organisations but an element of interferance where we need advocacy that we can take to a higher level that assures that independence is not threatened by these projects. 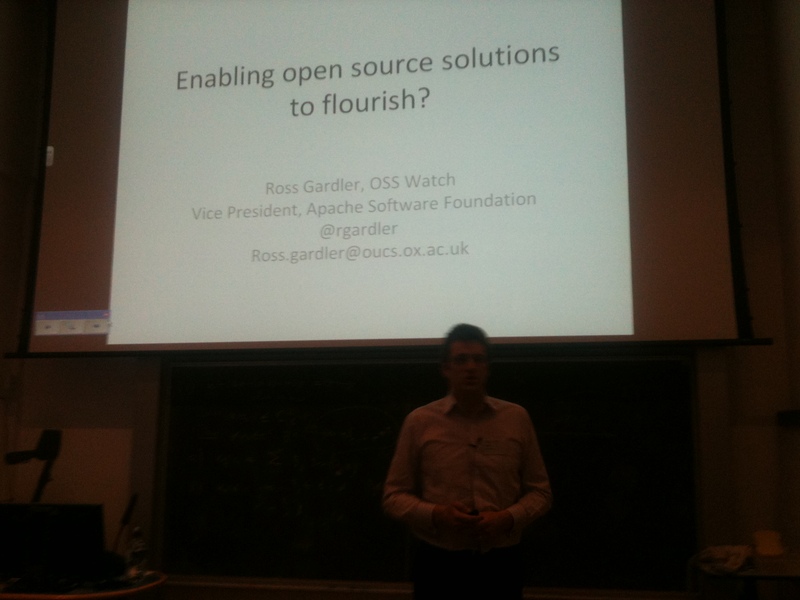 Ross) OSS Watch provide those arguements and toolkit for general sector, maybe specific need for library sector. Matthew Phillips) possible reasons to not flood to VuFind: may not be obvious how to integrate federated meta search but also that the new big idea is the gigantic index – EBSCO discovery service, Primo. The easiest way to buy these indexes is to use the interface from the same supplier and that makes it hard to make decisions. And this is a new area so harder to understand. Mike /index data) one big issue designing OPenURL Resolver. We can do tech but big companies do better for data. We can get funding to build OSS but harder to build open data repositories to make these things fly. Ben O Steen) Open Bibliography – all about putting data out there. British Library contributing 3 million records. PubMed estimate 23M records for journals. Also hammering at Open bibliographic principles with suppliers about making materials discoverable. However… if you’re buying an interface and an index what does it matter when the interface is ugly? They will go round you – use Google say. Ross) We are talking about programmatic and user interfaces here. JISC has put out a notice about the British Library wanting to work with others on OSS etc. – see JISC website for today’s announcement. ??) Negotiating with publishers etc. requires a lot of energy to replicate work that Serials Solutions etc. have done.
?) We do have licence negotiations with big piublishers for content. Can we also get metadata centrally as well. Need to leverage power of working together. Ross) Perhaps JISC collections should be this point of central contact. Ross) one way to form a community is to take cash and form a community. It doesn’t work. Communities emerge. They emerge from shared needs. If something satisfy’s shared needs. It ma be that VuFind is a product to form a community around. But a community is more than one person – but lets be realistic. Doesn’t need to be everyone but needs to be open to everyone.
?) Can’t legislate community into existance but can find places where communities can grow – communities do grow out of mailing lists for instance. Peopole already form communities around needs nad projects nad meetings etc. Might start thinking of the right places to build communities online. Ross) indeed. a common ground to congregate.
?) And a place for poeple to see what OSS is available – which LMSs, which search tools etc. A simple list is really useful. Ken) SCONUL already has a list in part. It is not complete but it does list LMSs etc. Not complete but lists many options. We have a bit there but anyone can add to. ANother thing I think we need – someone said you can set up those tools super quick so I’d like an Amazon cloud install/place to install that I can show colleagues so we can see what is involved and try out a tool – rather than long procurement service. Almost about running parallel instances so you can see the differences and see how both work on the same data. Almost a list of machines to play with to test things across institutions. Martin Hawksey) maybe on a stick – in the same idea of EduApps but for library systems and contact info for suppliers etc. Ross) an observation: I often make the argument that Open Source is a sort of open standard so I would suggest that if you build this community around common goals you will find people using standards approaches etc. As the community grows you will find things becomng more standards. Matthew Phillips) I think DLF ILF API (google that) are developing standards for fines, payments, patron look up etc. However closed source LMS suppliers aren’t supporting these wholeheartedly yet. Also JANGLE also helps with that – a standard API with drivers to connect to proprietary APIs. John Norman) do people here know about Google Summer of Code? Can we do something here? Ross) Every year Googld puts millions of dollars towards students building open source software for community projects. Its a great way to get students to understand OSS needs and for those using the software it allows various updates and additions that are not mission critical to be added and developed for you. John Norman) I was told one issue with non UK projects is that these UK based open source systems can’t handle Inter Library Loans so that might be a candidate. Ross) Maybe PTFS etc. might be able to put forward a mentor? Ross) Indeed. I am involved in an OU project that is like Google Summer of Code but in a formal educational environment. SO just get in touch adn we can help with that. Dave Flanders) Koha and Blacklight have lists but..
Matthew Phillips) we need generic space, all around products at the moment.
?) If you are being ambitious you could use Elgg – open source social networking tool – which could be used for this. Beuatifully suited to community of professionals. For a community of multuiple purposes it’s great. Ross) Elgg is great but tools don’t create communities, people do. I would suggest that something that suits this room would be best – we’re all techie here and we’re all on email so that’s probably the easiest way. Ian Dolphin) merge the mailing list with wiki page? KEn) wiki requires login to edit the page. It’s not elegant but it’s there.
?) Relationship between IT and library services are very good at my institution – mine is converged with one director. But they are not always great. Perhaps the prosaic suggestion here if for relationships to be improved. IT response is so often No that that is crucial. Ross) Absolutely. So important. One important thing about policy is that you have to get everyone – all possible groups – around a table together so that you all have a say and a good compromise can be found. In most instititions that would help relationships and understanding each other. 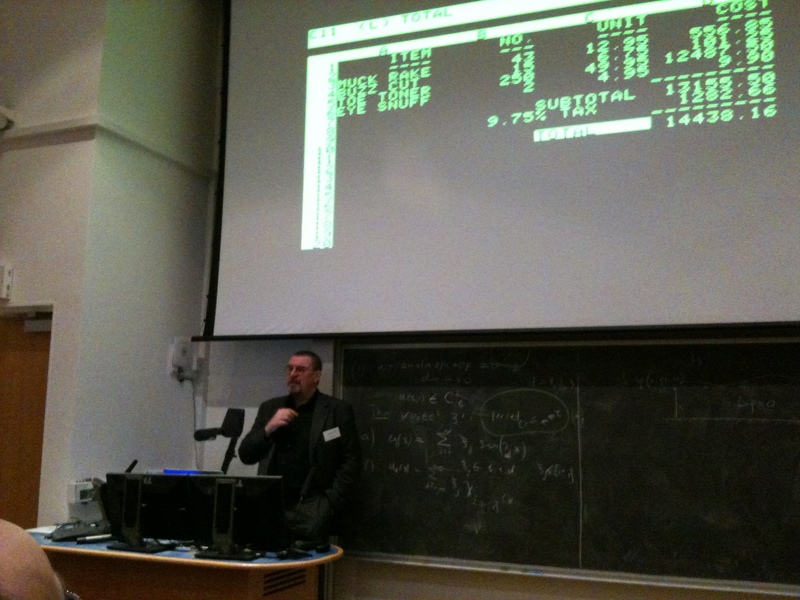 Ian Dolphin) back to something earlier – you demonstrated in your slides and impact of OSS Watch – that’s really great. JISC is also working on leadership and startegic role of ICT. a conversation to be had here to educate leadership of potential for open source as a strand of that. Ross) Yup, path of communicating upwards is very important in all areas. Ross) too many variables to see everything to compare – being able to see structures of development of open source doesn’t mean it’s better than closed. But if all things equal at face value it’s a fair thing to say. Can’t make a sweeping statement like that. ROss) OK to wrap up Ken will write up a report of today – should go to everyone and probably up on HElibtech page as well. A big thank you to organisers! Thanks Ken – for the compliments and the correction re: Primo. I’ll add a note into the post when I made some grammar/formatting/image edits later today.